Michelle lives down the road and has a family and a business down there south of Frog Holler. Yea. She has the time to come and walk with us once in a while and always adds to the conversation. Recently she dropped off this library book that she had read and that she had kindly renewed. 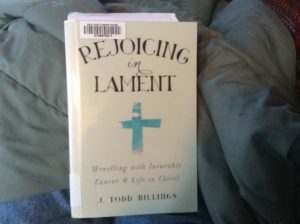 The book is entitled Rejoicing in Lament – Wrestling with Incurable Cancer and Life in Christ. There are some topics there. OK, know about wrestling, that’s a start. 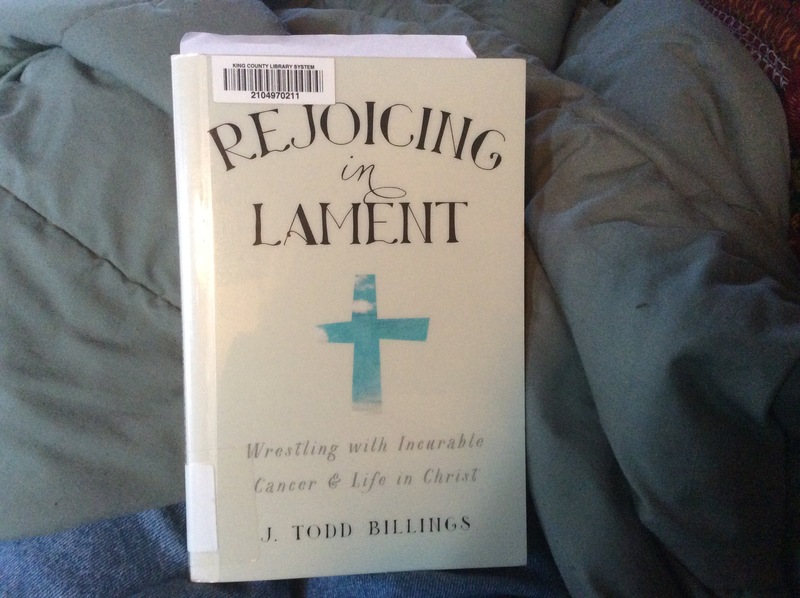 OK, learning about incurable cancer and life in Christ, yes. But rejoicing in lament, what is that? The beginnings of the book go back to the Hebrew Bible, the Old Testament, where there seems to be a lot of alternating of rejoicing and lamenting. We don’t even use those words very much anymore. There is exploration of the Book of Job and the Psalms. The Old Testament is so rich and full and has such a strange texture for me. You need special 3-D glasses to read it sometimes. But be that as it may the book opens up the doorway that we have already gone through. Not bragging mind you, but we have been living richly in the shadow of the cancer threat for years now. And not only that but when we separated healing from curing we did something major and life changing. And that is what the author is getting to here in a very slow scholarly way. A beautiful way too when he gets into this Old Testament mindset. So, all great and I am bound and determined to finish it before the library wants it back. Thank you Michelle for looking out for us here. We need more of you. Off to walk here in the snow. After that archery in the same snow. Hope we don’t loose too many arrows. « About As Cold As It Ever Gets Here.